Outdoor living spaces allow us to get closer to nature. Enjoy the fresh air, whether it’s a sunny day or starlit evening, a summer morning or crisp autumn afternoon. You don’t need a sprawling yard for an outdoor living space. A cozy courtyard can provide just the right size space to step out of your home and into an environment that soothes your soul. Here are some ways to perk up your courtyard. What vision do you have for your outdoor living space? Is it an English country garden, a French bistro, or a stylish veranda? Before you begin designing this exterior room, choose an underlying theme. Will you furnish it with an eclectic array of flea market finds, your favorite wrought iron furniture, or a new patio set? Will you do more lounging that requires comfortable seating or will your courtyard be the place where you dine al fresco? Of course, you can do both, but with limited space, you should consider your priorities. Think like an interior designer. Your courtyard doesn’t have a ceiling, but in every other way, it’s a room. Develop a color palette that brings it all together. Be consistent with your furnishings and accents, and even your plants. The harmony of colors will provide you with a harmony in the environment. Be generous with your greenery. The natural beauty of live plants adds grace, freshness, and color to an outdoor living space. You can plant a garden, design creative container gardens, and hang plants on your wall and planted along the border of your courtyard. With overhead beams, lattice, or other structure, hang plants and let vines crawl along as they grow. Consider mounting a trellis—or pallets for a rustic farmhouse look—on a wall and then attach a variety of colorful pots, perfect for an herb garden! Shed light on your courtyard. An evening in the fresh air is a welcome escape. Add lighting to your outdoor living space in a variety of ways. Solar-powered lights cast a soft glow. From strings of lights to lanterns and even lamps, you can sprinkle light wherever you want. Wall-mounted sconces offer a good solution for lighting your garden courtyard. Whether you use electricity, battery-powered candles, or the real thing, this sideways lighting will enhance your ambience. Of course, you can also mount lights on the exterior of your home’s eaves, as long as you use the right lightbulbs and shift them so they don’t act as spotlights. If you’ve ever sat by a pond or a crackling fire, you know the comforting and almost hypnotic effect of these natural elements. A small water feature, like a waterfall, and a fire pit is easily installed in a courtyard. Depending on your space, you can even insert a pond into the floor of your outdoor living space. Finish with a fifth wall. You can sit outside and watch the rain or avoid the direct rays of the sun if you have a canopy or awning to protect you. An awning is attached to the side of your home and can be opened and closed as needed. If you add a pergola-like structure with an open-beamed roof, you can use drape a canopy across the beams. Or, a good, old-fashioned umbrella might be just enough to give you more time outside, no matter the weather. Many of the single-family homes we build in Epcon Communities are designed with a garden courtyard. The home wraps around this outdoor living space, providing a private space. 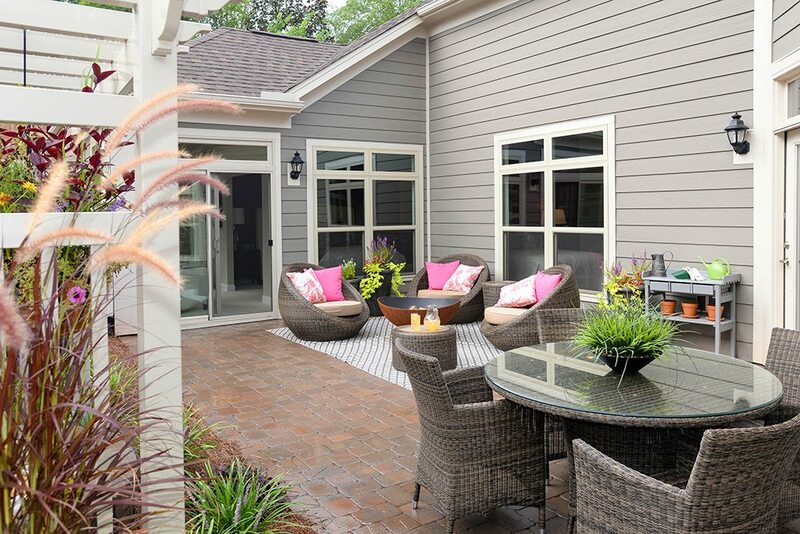 For relaxing, gardening, dining, or entertaining, these courtyards are a popular feature. Epcon Communities are located in 19 states, and we’re still growing. Experience the many benefits of living in our high-quality, low-maintenance homes, including community amenities and convenient locations.